Project Happiness has an actively engaged Facebook community of over 2 million people who are eager for tips on happiness. As we have grown, our ability to deliver content in innovative and purposeful ways has also expanded. We are happy to now be opening up our community to more resources and experts in the field – you! 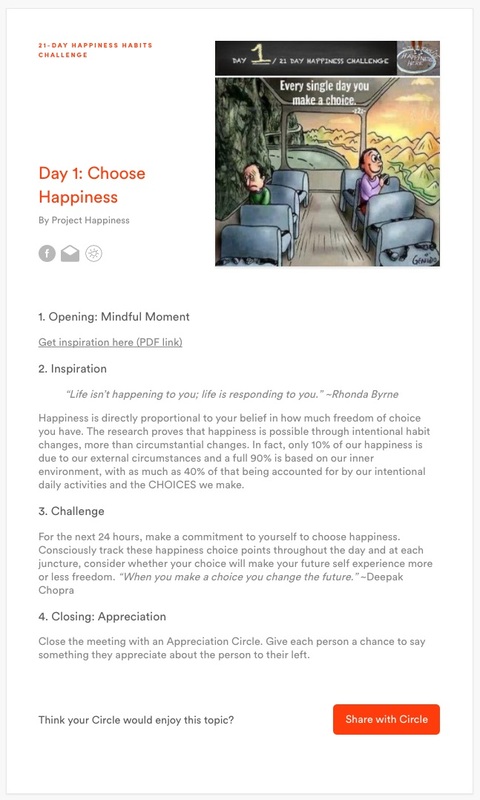 Circles by Project Happiness is a membership-based online community offering inspiration to individuals gathering around the world — both in-person and virtually. In our pursuit to make happiness accessible to everyone across the world, we wanted to create a tool that would address the growing global concern of loneliness and disconnection. So we thought, hey, why not kill two birds with one stone? Make their meetings purposeful and uplifting! We want to give them something good to talk about – happiness principles based on your book! Every month, a new book, program, or challenge will be featured showcasing six to ten Discussion Topics of curated content. You, our affiliate authors, represent experts in the well-being community – authors, scientists, therapists, coaches, and educators, just to name a few. As a featured author, you will have the visibility of a global stage to inspire people to action, to discover new capacities, and to pursue dreams and goals within the support of an engaged community. Who should submit their book to Circles? Anybody focusing on any aspect of happiness, and there are many! We like mindfulness; we like purpose; we like tips on empathy and forgiveness; we like focusing on self-compassion and essentially anything about living a thriving, fulfilling life. We like people talking about the things our community talks about. If your book/article/course isn’t about overall wellness and well-being, it’s probably not for us. Our Circles members include individuals from all over the world! We have men and women, a group of teenagers in the Phillippines, groups serving in the military, girl scouts, groups of teachers and educators, mommy play groups, teams in large companies, and our Circles grow every day! What is a Discussion Topic? A Discussion Topic contains excerpts from your book, program, or challenge. It’s presented in a simple format for Circles members to discuss and implement into their meetings. Each Discussion Topic contains: an image, direct quotes with discussion point(s), and finally a challenge. Our goal is to help our Circles members live more elevated lives through what they discuss and read. Good news – our team will assist you in putting together the content you’d like to showcase, and we’ll do the publishing onto Circles. Be original: please submit your original work. Include direct quotes and ideas from the media you’re providing — make it based around a theme for people to talk about. Create at least 6 Discussion Topics to go with your book, no more than 10. Keep your Discussion Topic within our formatting (don’t worry, you’ll get a document describing all of the information we need from you) – including a mindful moment, an Inspiration, and an actionable Challenge. Circles is about creating small changes in daily lives. Make sure your Discussion Topic leaves the group with something to think about, and a way to put that into action! Include photos for each Discussion Topic (image size in our formatting document). Keep it simple and cite any sources you reference. Review someone else’s book. If you’d like to suggest a book to be brought to Circles, please send us your suggestion here. Want to sponsor the Library or a book? Contact us at circles@projecthappiness.com for a chance to sponsor a book for a month, or for greater sponsorship opportunities!